The one certainty was that every measure tried to save the harvest failed. “All specifics, all nostrums were useless,” the historian Cecil Woodham-Smith observed. “Whether ventilated, desiccated, salted, or gassed, the potatoes melted… and pits, on being opened, were found to be filled with diseased potatoes–‘six months’ provisions a mass of rottenness.’” The blight struck everywhere that year, from North America to Belgium, and the Irish had long been distressingly familiar with disastrous harvests; twenty-four previous crop failures had been recorded between 1728 and 1844. Several of these had caused suffering “horrible beyond description,” and it has been estimated that very nearly half a million people died during Ireland’s “Year of Slaughter” (1740-41), when a freezing winter caused the oat crop to fail. But the catastrophe of 1845 was was remembered as the greatest of them all, and it affected Ireland more profoundly than it did anywhere else, with the possible exception of the Scottish Highlands. 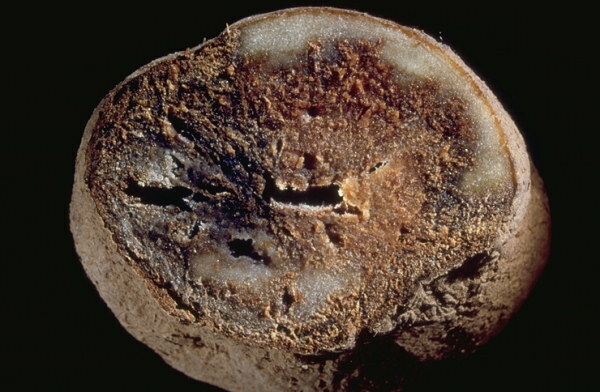 The fungus Phytophthora infestans was responsible for the great potato blight of 1846. The strain had its origins in Mexico at the time of the Spanish conquest in the 16th century. The underlying reason why the famine’s impact was profound was that the Irish population had ballooned at the same time as the amount of land available for Irish tenants to farm had been falling sharply. Ireland’s population rose from 3.2 million in 1750 to 8.2 million a century later: an enormous total, nearly a third higher than it is today. As it did so, the enclosure and seizure of what had once been common land by wealthy Protestant landowners was significantly reducing the acreage available to Catholic peasant farmers. The result was a severe shortage of land. By 1845, at least a quarter of Irish families scratched a living from tiny plots of five acres or less, and this in turn meant that, in order to survive, families had to turn over all their land to the cultivation of the highest-yielding, most nutritious crop. By 1845, the potato was not only the staple, but in many cases the only, food sustaining a huge number of men, women and children. The blight (which we now know was caused by a fungus) thus brought with it five long years of starvation. While the disease reigned, perhaps a million died of hunger in Ireland, and 1.5 million more were forced to emigrate. Had overpopulation been the sole cause of the catastrophe, the Great Famine of 1845-51 would be remembered today as a natural disaster on a grand scale – an act of god that could not have been averted. But the Ireland of the 1840s was a country run largely for the benefit of its landowning class. It was also scarcely some remote community on the fringes of the world, forced to fall back on its own inadequate resources. It lay close to the heart of the British empire, which was then the richest and most powerful state on earth. Had the British really wanted to, they could have harnessed those resources and minimised the loss of life. 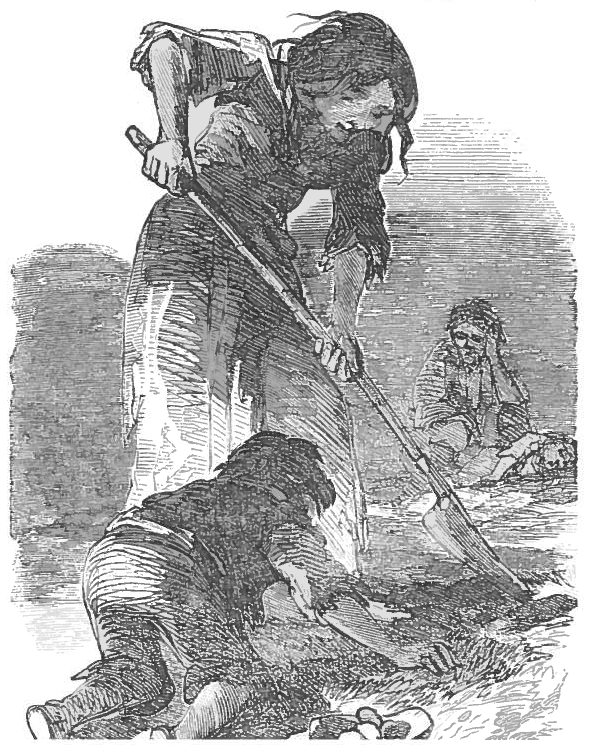 They failed to do so, and, in consequence, the famine produced bitter resentment in Ireland at the time – and a rich folklore thereafter. Abdülmecid I, just 24 years old in 1847 and the reigning Ottoman sultan, gave generously to the cause of famine relief – but did he also send ships packed with aid to Ireland? 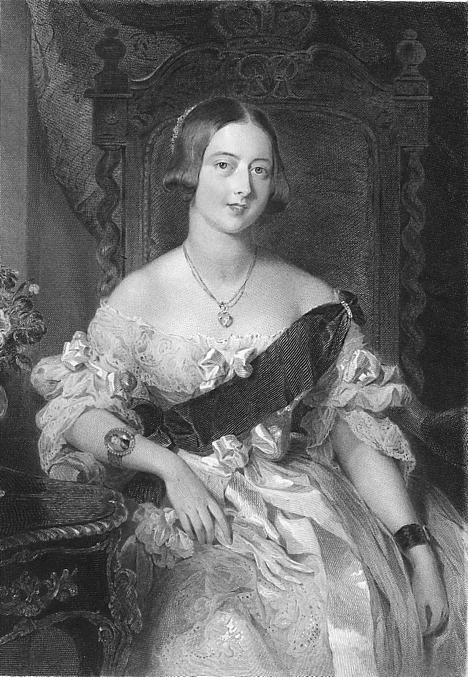 Queen Victoria in 1847, the year that her contribution to a private fund for Irish famine relief provided the basis for a potent piece of Irish folklore. What Sultan Abdülmecid did, meanwhile, is just as difficult to make out. It is generally accepted that the sultan sent a personal donation of £1,000 to London – an act of considerable generosity, particularly when it is remembered that there were no links of any real significance between Ireland and Turkey. But some accounts suggest that he did much more than that. In one version of the story, the sultan tried to give as much as £10,000 [£1 million now], only to be told that it would be diplomatically embarrassing for him to donate significantly more than had Victoria. In another, he responded by reducing his gift to a more acceptable amount – while simultaneously making sure that further help was sent behind British backs. It is still quite commonly believed in parts of Ireland that this aid took the form of several Turkish ships, which were quietly sent to unload badly needed foodstuffs in a port on the east coast. One telling of the tale even suggests that Abdülmecid’s merchantmen had to run the gauntlet of a Royal Navy blockade in order to bring their life-saving cargoes in Ireland. To understand why gifts given by two monarchs more than a century and a half ago are still remembered in Ireland, it is first necessary to grasp why private charity was vital in those famine years. Understanding charity, in turn, requires a brief sketch of official policy. The famine coincided with (and indeed contributed to) a fundamental shift in British economic policy, from the protectionism of the Corn Laws period – which saw tariff barriers erected in an attempt to safeguard the profits of the mostly Tory-voting landowning class in England – to the liberal doctrine of free trade. By late 1847, when the disasters inflicted by the potato blight were at their height, the British government he become a firm proponent laissez-faire economics, the idea that minimal regulation and minimal state intervention was the surest way to prosperity. Today, laissez-faire is commonly taken to mean “do nothing” in an excruciatingly heartless way – a sort of “I’m all right, Jack” economics that excuses the rich from all responsibility for the poor. It was not originally intended to mean any such thing, and the economists of the day hoped that limiting state intervention would also cut down on corruption and so make things better for everyone. Sir Charles Trevelyan cancelled state aid programmes in Ireland for fear that the poor would become dependent on government handouts. He welcomed famine as a means of controlling the Irish population. 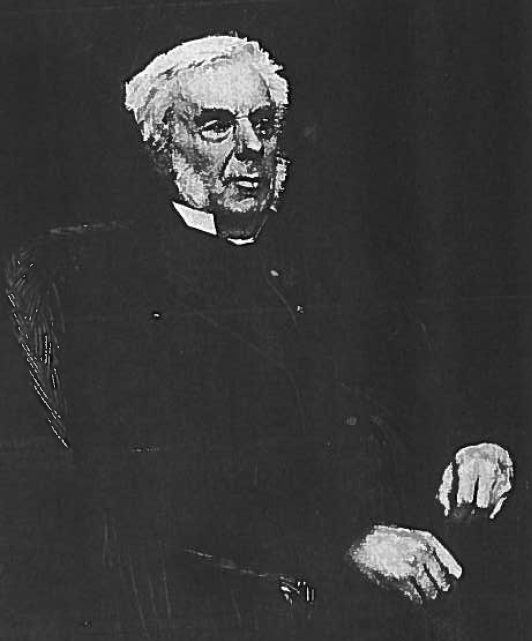 While it may be unfair to criticise Lord John Russell’s Liberal administration for its sincere belief that the market could be trusted to respond properly to the crisis in Ireland, however, it is much harder to understand its decision to place Sir Charles Trevelyan in charge of the relief effort, and allow him to end a programme that was keeping three million Irish men and women alive with a daily ration of soup and bread. Trevelyan’s views on Ireland were a matter of public record. He cared more that government aid might make the Irish permanently dependent on Britain than he did about the deaths of tens of thousands of men, women and children. In large part, this was because Trevelyan saw the blight (these are his words) as “a direct stroke of an all-wise and all-merciful Providence,” and starvation as “the sharp but effectual remedy” for the problem of over-population. 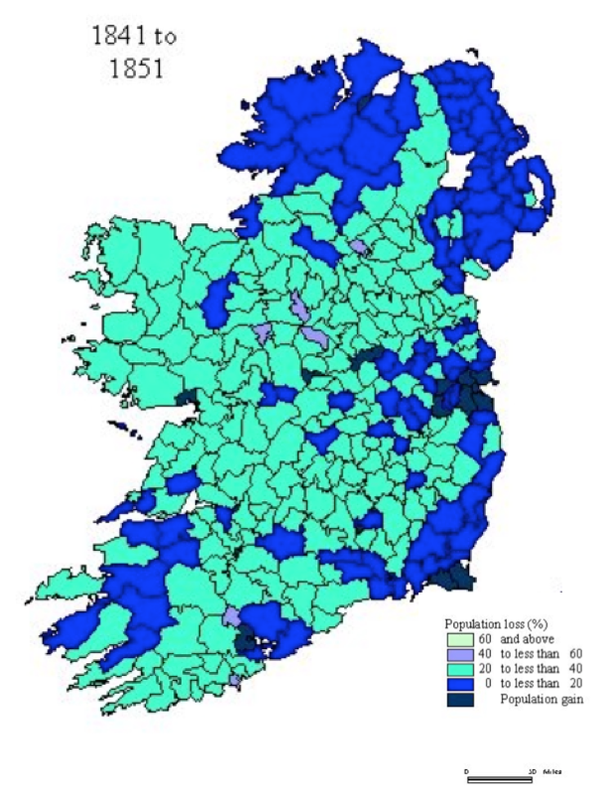 Loss of population in Ireland, 1841-51. The loss was greatest in the districts coloured purple, and still considerable in those rendered in green. Thanks to rural flight to the cities in search of food and work, the population actually rose in areas coloured blue-black. From Paul S. Ell, Mapping the Great Famine. Click to enlarge. All this meant that the only real prospect of delivering effective aid to Ireland was often private charity. Here the initial response to news of the famine in Ireland was generous; a great public appeal launched in England during the disaster’s peak year, 1847, raised £170,000 [equivalent to $25.6m today]. But the mood did not last, for existing prejudices also played an important part their part in determining responses to the famine. The Irish had long been seen by many Britons as as feckless and corrupt, the authors of their own misery and hence undeserving of aid. This was certainly something that Trevelyan believed – he wrote that “the greatest evil we have to face is not the physical evil of the famine, but the moral evil of the selfish, perverse and turbulent character of the Irish people.” The same message was driven home by dozens of Protestant churchmen, who preached that the potato blight had been ordained by God as just punishment for Popery and a heavenly verdict on an abuse-ridden and above all Catholic economic system. In consequence, as bad news continued to stream across the Irish Sea, the British public’s initial eagerness to help all too often gave way to indifference and worse. A second public appeal for famine relief, made only a few months after the first, raised a mere £30,000 [$2.9m]. Victoria was Queen of England, Queen of Scotland, Queen of Ireland and – nominally at least – the ruler of an empire that stretched around the world and upon which the sun never set. It would be a mistake, however, to imagine her in the image of her 21st century successors, forever touring different territories and greeting grateful subjects. In a reign that lasted more than 60 years, the famine queen spent no more than two months in Ireland, and a mere seven days in Wales. Her relationship with Ireland was a complex one. The monarchy was popular there, much more so than was the British state, and thus played in important role in maintaining peace and stability in what was an increasingly turbulent period. James Murphy writes of royalty as a “golden bridge… whereby the Irish might become reconciled to their position within the United Kingdom.” Yet popular belief – in Ireland at least – holds that Victoria disdained all things Irish, and that, for the whole of the famine years, she took little or no interest in the plight of her subjects on the far side of the Irish Sea. That is contestable, but it is certainly true that one motive for her decision to make a first journey there in the summer of 1849 was because (as she herself wrote, in the usual third person) “it must be disagreeable to her that people should speculate whether she dare visit one of her dominions.” The trip itself was kept brief and private, and had to be carefully stage-managed. The Queen and her consort, Prince Albert, travelled by sea. Their itinerary called for no visits to any hospital or workhouse, avoided the need to journey through the devastated countryside, and kept the monarch well away from any contact with the rural poor. Victoria and Albert leave Kingstown (today Dún Laoghaire, the port of Dublin) for Belfast on 11 August 1849 – neatly avoiding any need to travel through the famine zones in the Irish countryside. Victoria received an enthusiastic reception from the Irish that she did encounter, and it is estimated that as many as a million people may have thronged to see her – though some members of the Catholic clergy, notably Michael Slattery, the Archbishop of Cashel, complained bitterly of the Queen’s “indifference” to the poor, and refused to sign a Loyal Address. She recorded some generally positive impressions, finding Ireland “rather foreign,” and Cork “not at all like any English town,” but noting approvingly that “the women are really very handsome… such beautiful black eyes and hair and such fine colours and teeth.” What she did not do, during her visit, was make any contribution to the cause of famine relief. There is no evidence that she was criticised for this, and that was very probably because she had already made an appropriate donation two years earlier. Whatever the legend that grew up later around the Queen’s contribution to the cause, contemporaries believed she had been generous. There is, in fact, no room for ambiguity about the scale of her donation. When the British Association for the Relief of the Extreme Distress in Ireland and the Highlands of Scotland – which would become the main private fund-raising group sending money to Ireland – was organized in 1847, it was quick to boast in print that “Her Majesty the Queen immediately directed that her name should be placed at the head of a list of donors for a contribution of £2,000 [about $330,000 today], with a most gracious promise of such further amount as the exigency might demand.” This made Victoria, in fact, by some distance the largest private donor to the relief effort, and she later gave a further £500 to a Ladies’ Clothing Fund. Bridget O’Donnell and her children – one of several engravings made late in 1849 by the Illustrated London News that have helped to fix historians’ perceptions of the catastrophe. The pregnant O’Donnell was evicted from her cottage for non-payment of rent and subsequently miscarried. Clearing the Queen of contributing a purely derisory amount, however, does not solve the mystery of why the Irish came to believe so firmly she had done so. Nor is it the same thing as concluding that her donation was much more than a token. There can be no doubt, in this respect, that she could have given more – she received an income of £385,000 a year from the British government’s Civil List (£60,000 of which was intended for her private use), personally owned vast tracts of land, and had a private fortune of some £5 million. 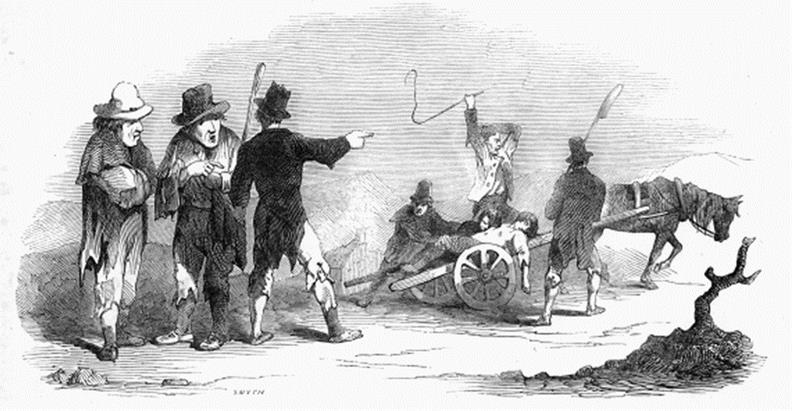 Food riots were a feature of the famine in several of the worst-hit districts. Here a mob attacks a potato store in Galway, in the impoverished west. Government assumptions that the laws of supply and demand would ensure a good supply of affordable provisions had proven mistaken. There seems to be no evidence that this was in fact the case, and the reality, insofar as it can now be traced, is that contemporary Irish anger was directed at Victoria’s ministers, and not directly at the Queen herself. The moderate Dublin paper The Freeman’s Journal called for a sharp line to be drawn between the monarch and her “starvation ministry,” and for the most part this was what happened. The Prime Minister, Lord John Russell, was labelled “the Attorney General of Starvation” by the Irish press, and Lord Clarendon, the Queen’s representative in Dublin, acquired the epithet “the starvation Viceroy,” but the association of Victoria herself with blame for the famine dates only to her Golden Jubilee celebrations in 1887. In one highly ironic sense, this damaging development was a product of a successful British propaganda campaign. The government of the 1880s strove to turn Victoria and her Diamond Jubilee into a symbol of British success. If she could take credit for imperial triumphs, though, the Irish nationalists responded, she ought also to accept the blame for British failures, not least the disasters of the famine years. Criticism of of the Queen escalated in the decade or so that followed – the fiery Irish nationalist Maud Gonne coined the phrase “famine queen” to describe Victoria at the time of the elderly monarch’s state visit to Ireland in 1900 – and it was given an unexpected new focus by the “Kerry bog slide“, a catastrophe that swept a tide of liquid peat a mile wide and 30 feet deep through a valley in south-west Ireland on 28 December 1896. In the aftermath, it was reported, Victoria donated £5 to Katie Donnelly, an Irish girl whose mother, father and six siblings all died in the disaster. Though the donation was in line with others received at the time, it seemed pathetically inadequate compensation for such a complete loss, and James Murphy notes that the nationalist newspaper United Ireland “drew attention to the incident and used it to criticise the amount of Irish tax payers’ money the queen was receiving for her upkeep.” It may be that confused accounts of this donation fused with memories of the hungry years to create the specifics of the Queen’s legendary meanness in 1847; at least, no other such incident that might have been conflated with the Great Famine in Irish minds has yet been discovered. If Victoria had proposed to give only £1,000 to the Irish, then, but was persuaded to increase that to £2,000, what of Abdülmecid? It is here that the story gets both more complicated and considerably more fascinating. The bare facts are that the records of the great relief association do record a donation from the Turkish sultan, and that the amount subscribed was £1,000: itself twice what Prince Albert had donated, and the same as the sums gifted by Victoria’s mother and the King of Hanover. That would have been remarkable enough, given that by 1847 the Ottoman Empire was the “Sick Man of Europe,” practically bankrupt, and still struggling to recover from the Greek War of Independence and a large-scale revolt in Bosnia. What is even more surprising is that there is really is good evidence that the Sultan had wanted to give more – and even hints that, when he was persuaded not to, he took private steps of his own to send aid of the most practical kind. Irish accounts dating to the 1850s insist that this aid came in the form of three ships stuffed with food, which succeeded in unloading their precious cargoes on the wharves of Drogheda. The Irish port of Drogheda, on the River Boyne, during the famine period. Let us look, first, at the legend, which in its most detailed incarnation is of worryingly recent origin. It came to popular attention only in 2010, when Mary McAleese, the then President of Ireland, delivered a speech during an official visit to Turkey. According to McAleese, not only did the Irish owe a debt of gratitude to their hosts for Abdülmecid’s generosity a century and a half earlier, but Drogheda’s coat of arms had been modified to commemorate the docking of the Sultan’s ships with the addition of some Muslim symbols: a crescent moon and star. The Irish press spent an enjoyable day or two demolishing these claims – Drogheda’s arms turned out to have been granted eight centuries earlier by King John – but in the process they did lay the local origins of the legend bare. A plaque commemorating the arrival of Ottoman aid in Drogheda, it transpired, had been placed on the Westcourt Hotel in 1995 (according to the city’s mayor, Frank Godfrey, the hotel had formerly been the City Hall, and must therefore have been where the Sultan’s seamen had been put up in 1847). Godfrey had had the tale from the Turkish ambassador to Ireland, one Taner Baytok. Baytok, in turn, had been told it by an old woman who lived in a retirement home located directly under the Turkish embassy in Dublin, and verified the story by turning up an article that no one else seemed to be able to find. It had been written, he recalled, by Thomas P. O’Neill – by then dead, but a very real and highly distinguished professor of history at University College Galway, the author of the authorised biography of Éamon de Valera – and published in a magazine titled The Threshold. But attempts to locate the article, and indeed the magazine itself, all failed. Nor did the Başbakanlık Osmanlı Arşivi, the Ottoman archives in Istanbul, turn out to contain any record of the dispatch of Turkish vessels to Ireland. 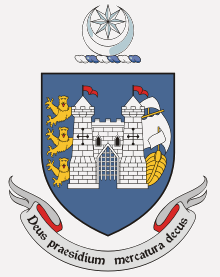 The coat of arms of the Irish port of Drogheda, showing the crescent moon and star (top) that confused Mary McAleese. It would be all too easy, given this convoluted state of affairs, to assume that the story of Abdülmecid’s ships was nothing but the product of fantasy or error – and perhaps even that there was no truth in the suggestion that the Sultan had been pushed to reduce his offer of monetary aid to a level which would not embarrass Queen Victoria. Easy, but wrong, because a little additional research turns up a fascinating paper trail that not only seems to confirm accounts of Abdülmecid’s generosity, but even provides an intriguing hint that Ottoman ships may indeed have docked at Drogheda. 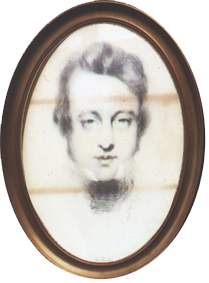 The story of the Sultan’s determination to make a substantial donation to famine relief, to begin with, can be traced back to Charles Mackay’s supplement to W. Cooke Taylor’s three volume Life and Times of Sir Robert Peel. This is a contemporary source, published in 1851, and it was written by a noted journalist who not only worked for, and went on to edit, the highly influential Illustrated London News, but was also the father of Marie Corelli, the most spectacularly successful popular novelist of the late Victorian period. Mackay himself is still remembered for his Memoirs of Extraordinary Popular Delusions and the Madness of Crowds, and he published his fourth volume to Taylor’s biography of the former Prime Minister only a handful of years after the events that he described. 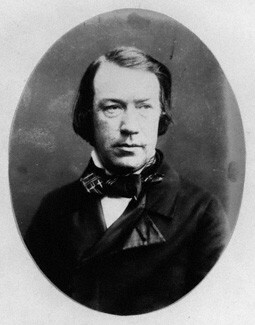 Charles Mackay, the Scottish biographer of Sir Robert Peel, was the first to ascribe an attempted donation of £10,000 to Sultan Abdülmecid I. Photo: Herbert Watkins, late 1850s. It is worth pausing here to consider Mackay’s brief passage in greater detail, for it contains in essence the full version of all modern accounts of Abdülmecid’s contribution: the offer of £10,000, British objection to the offer, and its revision to a more fitting total. Mackay also seems to have been the earliest author to mention the idea of Turkish aid ships, though it will be noted that his account implies that the idea of sending them was dropped when the Sultan’s gift was scaled back to £1,000. I have done some brief research into Mackay and his sources without really being satisfied that I can account for where he got this extraordinary information. He was a well-connected journalist, but there is nothing in the brief life contributed to the Oxford Dictionary of National Biography by Angus Calder to suggest that those connections extended to the world of politics. Mackay was, moreover, a lifelong liberal, while Peel had led the Tories [that is, the conservatives], which must imply that he was unlikely to have been especially close to many figures in the government of the time. 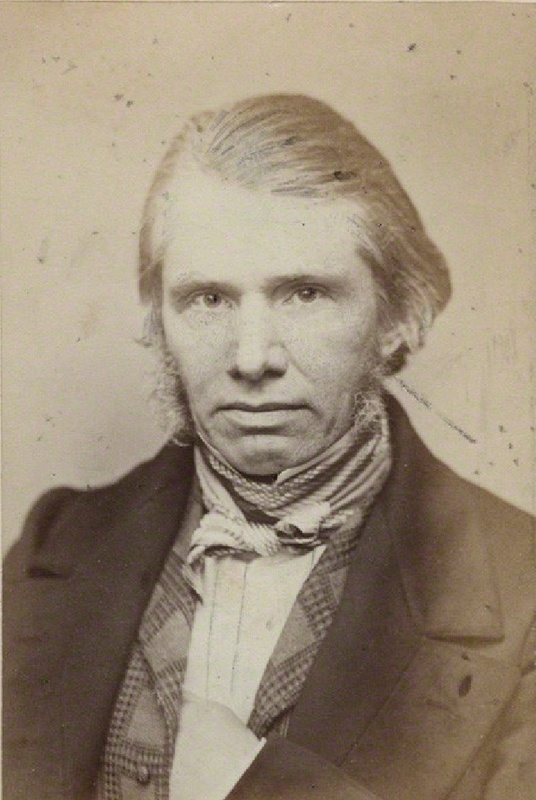 William Cooke Taylor, author of the first three volumes of Peel’s Life and Times, was centrally placed in the British administration in Dublin. Image: Wikicommons. Whatever the truth, there are three other works that bear on the question of the Ottoman Sultan’s efforts to aid Ireland and these, together, help to fill out and confirm much of Mackay’s account. The first is the mysterious article written by Thomas P. O’Neill, and cited by Taner Baytok; the second a book that O’Neill points to, the journals of the Irish nationalist politician W.J. O’Neill Daunt. The third is the shipping records of Drogheda, researched – since the originals are not available to historians – in local newspapers by the Irish writer Brendan Matthews. Between them, these sources tell us all that we know, if not all that we may ever find, about the mysterious Turkish ships that are supposed to have appeared on the Boyne in 1847. It is sensible to start with Thomas P. O’Neill and the article that he placed so obscurely in The Threshold. With a certain amount of effort I was able to establish that this publication did exist.§ It was not, however, a journal of history, but the house magazine of the Lyric Players, a theatre company founded in 1951 and based in the Lyric Theatre, Belfast. Under the editorship of the Players’ founder, Mary O’Malley, The Threshold published mostly poetry and literature, but also a smattering of articles on Irish history. O’Neill’s contribution, which appeared in its second issue in the summer of 1957, was titled “The Queen and the Famine.” It provides a thoroughly researched (if unfortunately unreferenced) overview of the whole of the story. O’Neill seems to have been the first historian to discover Spring Rice’s explosive manuscript account of his wranglings over the amount of Victoria’s donation, and was certainly the only one sufficiently familiar with local folklore to understand the significance of what occurred when the famine queen’s statue was removed from its plinth in Dublin. As was noted above, he also knew enough of William J. O’Neill Daunt to realise that Daunt’s journal provided the vital clue that apparently resolves one central mystery of this obscure byway of history – how Abdülmecid acquired an interest in Ireland in the first place. 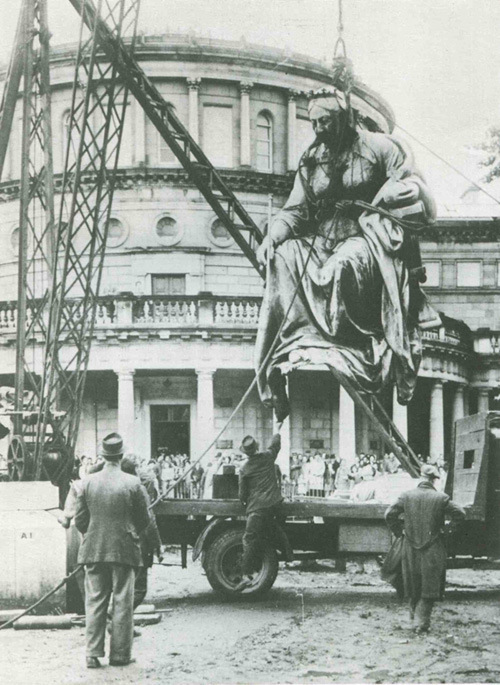 The removal of the statue of Queen Victoria from outside the Irish parliament building, Leinster House, in 1948. It was probably on this occasion that a spectator stepped forward and waved a £5 note at the Queen, 101 years after her donation to famine relief sparked the events dissected in this essay. The statue was preserved and re-erected some years ago outside the Queen Victoria Building in Sydney, Australia. Now, Daunt cannot have been Mackay’s source, for he met Justin McCarthy’s son two years after the final volume of Peel’s Life and Times was published. It is possible that Mackay was McCarthy’s, but the incidental detail and the addition of Lord Cowley (who was the Duke of Wellington’s nephew and certainly was ambassador to the Sublime Porte at this point) in Daunt’s account implies that this was not the case. It is possible to suggest, therefore, that the two versions of the tale are probably independent and hence corroborate each other. Finally – the handful of readers who have staggered this far will be heartened to know – there is the matter of the shipping records of Drogheda, the small port to the north of Dublin at which, Irish tradition insists, Abdülmecid’s cargoes were unloaded. These records are summarised by both the local newspapers of the day, the Argus and the Conservative; shipping news was a staple of most periodicals at this time, since it was vital to the fortunes of the merchants and investors who made up a high proportion of their readers. They suggest that ships hailing from anywhere but Ireland and Britain were rarities in famine-era Drogheda – a point that would certainly explain why the Sultan’s ships seem to have made a great impression in the port’s collective memory. Nonetheless, no fewer than three vessels flying foreign flags did tie up at Drogheda between 10 and 14 May 1847, some five months after Abdülmecid would have read the appeal issued on behalf of Queen Victoria for aid to be sent to Ireland. W.J. O’Neill Daunt, whose 1853 meeting with the son of Abdülmecid’s surgeon provides some corroboration for the legend of Turkish aid to Ireland in the famine years. From a photo taken 40 years later, in old age, and published by his daughter. According to the researches of Brendan Matthews, one of these ships was probably Prussian: she was named the Meta, and her home port was Stettin, on the Baltic Sea. The other two, however, came from the Balkans, which were then still under Ottoman control. They were the Porcupine and the Ann – two rather English names for ships – and they apparently had English masters, for their names were Cleveland and Cloid (Floyd?) Nonetheless, they had sailed from Ottoman Selânik (today Thessaloniki, in modern Greece). All three merchantmen carried cargoes of wheat and “Indian corn” – cheap maize, one of Ireland’s principal imports during the famine years. 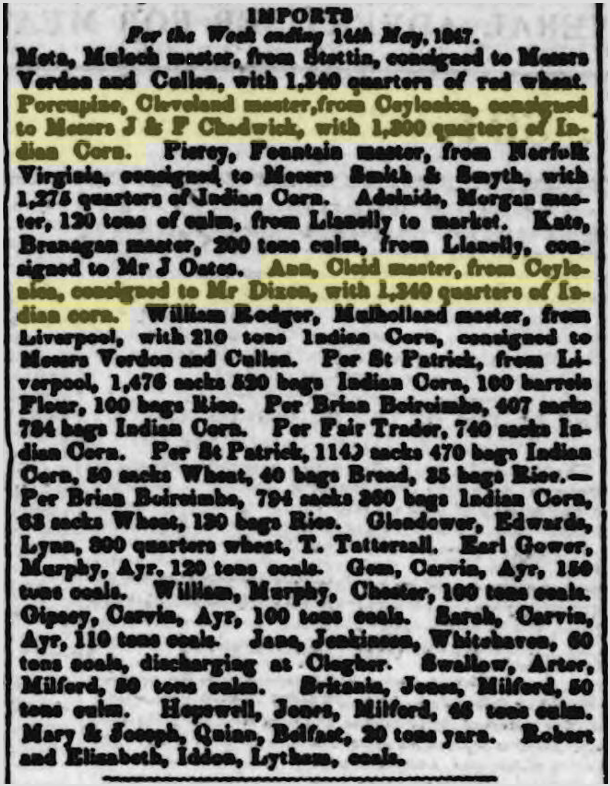 This is a remarkable find – more so given the rarity of foreign commerce in small Irish ports in those days – but it is only fair to point out that the newspapers contain a strong indication that the cargoes of the Porcupine and the Ann were trade goods, not charity; they were consigned to local merchants based in Louth and Meath, who it might be expected would sell them rather than give them away. Speculation in imported corn, moreover, was scarcely unheard-of two years into the Great Famine; the Ottomans grew it, and the owners of the Porcupine and the Ann presumably knew that they did. It is, of course, still possible that the two ships were chartered on Abdülmecid’s orders, and perhaps the only way of now guessing if they were would be to establish if they were the only vessels out of Balkan ports to unload cargoes in Irish ones during this period. If it could be established that other ships from Turkish ports called at Drogheda or Kingstown in those years, the case for a regular commerce in importing foodstuffs for the starving Irish would become a great deal stronger. Whether or not the ships brought wheat and corn for free distribution or for sale, however, it is possible to speculate that a remarkable chain of happenstance was forged in Drogheda during the starvation years. A wealthy queen’s donation, a Sultan’s noble gesture, and the coincidental arrival of unknown ships from unknown ports could well have supplied the germs of legends that continue to resonate in Ireland today. § I note that since I went to all this trouble, months ago, Google Books has digitised a run at Indiana University and made it available for searching via snippet view. Such are the travails of the non-digital researcher. ¶ I did locate one published allusion to Abdülmecid’s desire to contribute a sum greater than £1,000 to famine relief that predates Mackay’s work – a travelogue on Smyrna that appeared, rather obscurely, in the ninetieth volume of Colburn’s New Monthly Magazine and Humorist in 1850. Since this passing reference did not mention the larger sum of £10,000, or the ships, it cannot have been Mackay’s source, but it does indicate that the story was somehow in circulation before he wrote. My thanks to Megan Halsband of the Library of Congress for her help in tracking down a copy of Thomas P. O’Neill’s elusive Threshold article. Anon. “Cork and the Queen’s reign. Freeman’s Journal, 1 May 1897. Anon. “Obituary: Wm. Cooke Taylor, LLD.” Gentleman’s Magazine, January 1850; Anon. “President of Ireland Mary Robinson addresses the Choctaw People.” Bishinik: The Official Publication of the Choctaw Nation of Oklahoma, June 1995; Anon. “Sidelines.” History Ireland 18, May/June 2010; Anon. “Matthews uncovers more proof about aid from the Ottoman Empire.” Drogheda Independent, October 17, 2012; Henry Christmas. 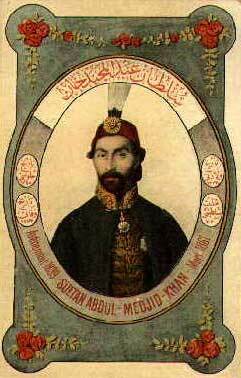 The Sultan of Turkey, Abdul Medjid Khan: a brief memoir of his life and reign, etc. London: Shaw’s Family Library, 1854; Alison Comyn. “Ottoman ships on the Boyne.” Drogheda Independent, May 23, 2012; KH Connell. “Land and population in Ireland, 1780-1845.” Economic History Review 2 (1950); William J. O’Neill Daunt. A Life Spent for Ireland. Being Selections from the Journals of the Late W.J. O’Neill Daunt, Edited by his Daughter. London: T. Fisher Unwin, 1896; Paul S. Ell. “Mapping the Great Famine.” Unpublished paper, School of Sociology, The Queen’s University of Belfast, 2000; S. Engler et al. “The Irish famine of 1740-41: famine vulnerability and ‘climate migration.‘” In Climate of the Past 9 (2013); Peter Gray. Victoria’s Ireland? Irishness and Britishness. Dublin: Four Courts Press, 2004. Said Gul. “The Great Irish Famine and the Ottoman humanitarian aid to Ireland.” The Pen, 30 December 2011; John Killen. The Famine Decade: Contemporary Accounts, 1841-1851. Belfast: Blackstaff Press, 1995; Christine Kinealy. “Private responses to the famine.” Multitext project in Irish history, nd; Christine Kinealy. “International relief efforts during the famine.” Irish America, August/September 2009; Christine Kinealy. “Famine Queen or faery? Queen Victoria and Ireland.” In Roger Swift & Christine Kinealy (eds), Politics and Power in Victorian Ireland. Dublin: Four Courts Press, 2006; Christine Kinealy. “‘The widow’s mite’: private relief during the Great Famine.” History Ireland 16 (2008); Noel Kissane. 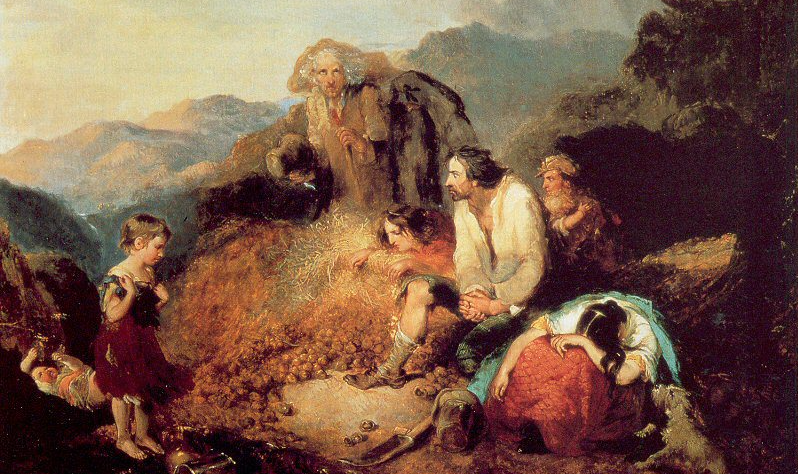 The Irish Famine: A Documentary History. Dublin: National Library of Ireland, 1995; James Loughlin. The British Monarchy and Ireland: 1800 to the Present. Cambridge: Cambridge University Press, 2007; ‘Mahmouz Effendi.’ “Smyrna: the ‘City of Figs. '” Colburn’s New Monthly Magazine and Humorist 90 (1850); James H. Murphy. “Fashioning the Famine Queen.” In Peter Gray (ed), Victoria’s Ireland? Irishness and Britishness, 1837-1901. Dublin: Four Courts Press, 2004; Thomas P. O’Neill. “The Queen and the Famine.” In Threshold v1n2 (Summer 1957); Philip O’Regan. “Skibbereen and the Great Hunger.” Southern Star, 9 May 2009; Patrick O’Sullivan. The Meaning of the Famine. Leicester: Leicester University Press, 1997; WC Taylor and Charles Mackay. Life and Times of Sir Robert Peel. London, 4 vols. : Peter Jackson, 1846-51; Lytton Strachey. Queen Victoria: A Life. London: Chatto & Windus, 1921; Roger Swift and Christine Kinealy. Politics and Power in Victorian Ireland. Dublin: Four Courts Press, 2006; Weldon Thornton. Allusions in Ulysses: An Annotated List. Chapel Hill: University of North Carolina Press, 1968; Pauric Travers. “Reading between the lines: the political speeches of Charles Stewart Parnell.” Studia Hibernica 31 (2000-01). What a marvellous piece of research! Ok, you believe she could and should have contributed more, which is a fair point. What’s your opinion on her supposedly preventing the Ottoman emperor contributing more and ordering the blockade of ports to prevent the aid ships arriving? Have no connection to anyone in that part of the country but the claims have intrigued me since Drogheda United and Trabzonspor fans formed a friendship, based on the tales of Turkish aid. A friendly match was organised between the two clubs, but the weather ensured it never happened unfortunately. The Turks, a great bunch of lads. That was very well written and an enjoyable read. 1. The American news weekly The Albion, 21 July 1849. No source for the information is given. 2. The story is repeated in the Brooklyn Daily Eagle, 29 September 29 1849. Christine Kinealy cites this one. It seems doubtful Mackay would have had access to either of these stories. Maybe both he and the journalists concerned were tapping an earlier source? But if so, it seems likely to have been a printed one. Nonetheless, they had sailed from Turkish Thessalonica (today Salonika, in modern Bulgaria). Correct: They had sailed from Ottoman Selânik/سلانيك‎ (today Thessaloniki, in modern Greece). Thank you – correction made. Its like Hitlers Mother was forgotten about and is hailed by an ignorant un educatted mob of idiots-praising all Royals ireguardless of weather they were good or evil. People should be ashamed of this Queen she was a Demon. Dia go deo leis an Tuirc! This is not a Tale ! On the letter it says “Emperor of Turkey”. Was it common to refer Ottoman soils as “Turkey” in those times? In short, while the letter was undoubtedly very sincerely meant, its terminology might have been considered a little offensive at the Ottoman court. And to prog: Yes actually, it’s kind of a funny thing … ‘Turk’ and ‘Turkey’ were always the name used by Europeans to describe the Ottomans, from Day 1. In case you wanted to know it was the Chinese who originally labelled them that (or a version of that), and the label made its way with the people down the Silk Road. Within the empire the term essentially was a non-thing; in fact, due to the Ottoman millet system, which organized the population by confessional community; none of the labels we now think through like Turk, Kurd, and Greek were in regular usage, in favour of Orthodox Christian (millet of Rum[Rome]), Muslim (making Turks and Kurds one people by that mindset, just with different regional language conventions, a source of today’s troubles wherein—glossing massively here—’Turks’ can’t understand why ‘Kurds’ want to be ‘different’ these days when for centuries they were ‘the same’), Jew, etc. (the label ‘Armenian’ was in usage under millet because it was subdivided along sectarian lines into Apostolic and Catholic) All these national terms were resurrected later when Western European style nationalist ideology began to be imported into the Ottoman Empire. While ‘allkindsofhistory’ is quite correct in saying that, by origin, the Ottomans were a Turkic people, do bear in mind that the concept of a Turkic national umbrella identity did not exist until the advent of linguistic science and its ideological infusion with the racial science of the time, particularly in the 19th century. Indeed, at the time of the Ottoman conquest of Constantinople in 1453 some contemporary Italian humanist scholars declared it a revenge attack of the people of Troy (in modern-day western Turkey) for its conquest by the conglomoration of Greek city-states. In the city-state (as opposed to nation-state) mindset of the time, where you’re from is important above all other subcategories of identity. There were pockets of peoples of, for lack of a better way to describe it, ‘obvious’ Turkic background within the multicultural empire (whereas the high-up Ottomans themselves were—again, carelessly put—heavily ‘mixed’ as all elites of empires are via diplomatic marriages). Those, however, were called ‘Etrak’ not ‘Turk’ in the Ottoman language; let’s call them ‘Turcoman’ in English for the sake of clarity. Notably, the Ottoman language was perhaps syntactically Turkic but was a deep mixture of Anatolian Oghuz Turkic, Persian (the regional language of high culture), and Arabic (the regional language of law and theology—the same thing back in the day; see canonical law). Ironically the Europeans didn’t get the memo that this was a terminology reclamation effort, and when the new Turks of the Republic of Turkey proudly proclaimed themselves ‘Turks’, Europe said, ‘Um, yeah, we knew that already’. Well done. A very enjoyable read. I don’t agree with everything you write but that’s fine. You say that the production of food in Ireland is fiercely debated yet your link goes to a BBC propaganda site that begins “A million people are said to have died of hunger in Ireland in the late 1840s, on the doorstep of the world’s richest nation”. Writing “said to have died” is clear disinformation. Ireland was a core part of the world’s richest nation in the 1840s and 1850s, not on its doorstep. Uncontrolled population growth and the blight were not the cause of the famine. The cause of the famine was British policy in Ireland, including the theft of Irish land bu Cromwell and its transfer to a system of planter landowners, in effect a garrison. England’s population was rising much more rapidly than Ireland’s and Scotland’s nearly as fast (due to the energy subsidies of burning coal and occupying other people’s countries). Only Ireland, though, suffered a catastrophic population, social and cultural collapse. Ireland’s population did not begin to rise again until the 1920s. It is clear from its actions that Britain saw the rising Irish population (around two thirds of England’s) as a threat. Once Ireland was incorporated into the UK, Irish industry was decimated, except in parts of the north. The British ruling class decided that (most of) Ireland’s future was as an export-orientated livestock farm, to produce, firstly, food for England’s burgeoning population of industrial workers and, secondly, people, to work in England’s factories, to fight in its army and to people its colonies. The famine was the worst social disaster in nineteenth century Europe. The British state holds full responsibility for it. Incidentally, our friend Trevelyan went on to apply the same tactics to the Indians, who the British continued to starve until 1943. Ireland has been recovering from the British occupation since the early 1920s. Famine in India stopped after 1947. Coincidence? You decide. Very interesting information Breandάn. Thank you. back from 16th century, western europeans, inc. venetians, germanic tribes of vienna, habsburgs, portuguese, swedes, french, etc. with anti-turkish sentiments have been calling ottoman turks as “the bloodthirsty turks”, “the devil turks”, “the terrible turks”, “the wolf turks”, etc. how come ottomans have been called as turks when it comes to bad things, but ottomans have not been called as turks when it comes to good things? A brilliant piece of investigative journalism – thanks so much from the depths of my Irish heart and my Muslim soul! An excellent investigation and article.